biocreativity | art. biology. creativity. science. design. nature. 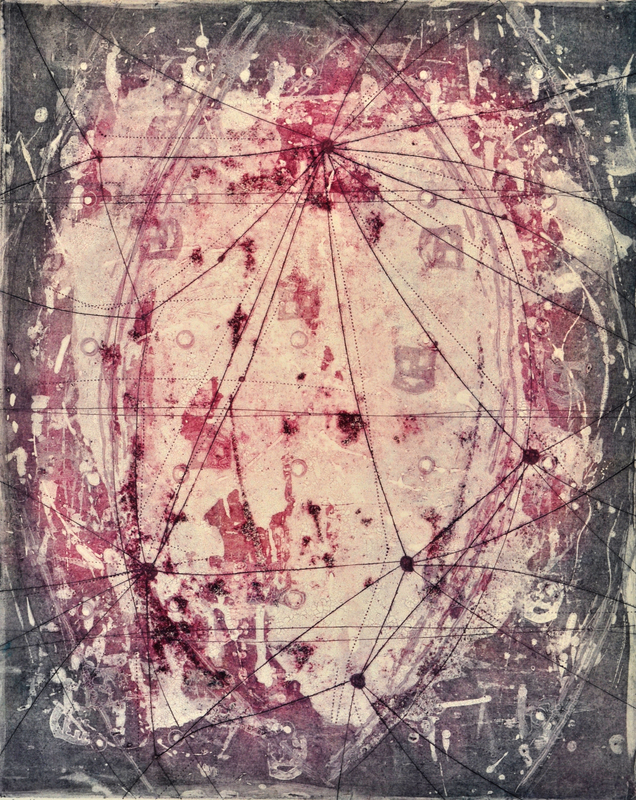 I am pleased to welcome printmaker Ruthie Powers to the biocreativity blog as a continuation of the Art + Science Series. Ruthie will be joining Annell Livingston, Landry McMeans and Laura Moriarty in our GEO_____ show! 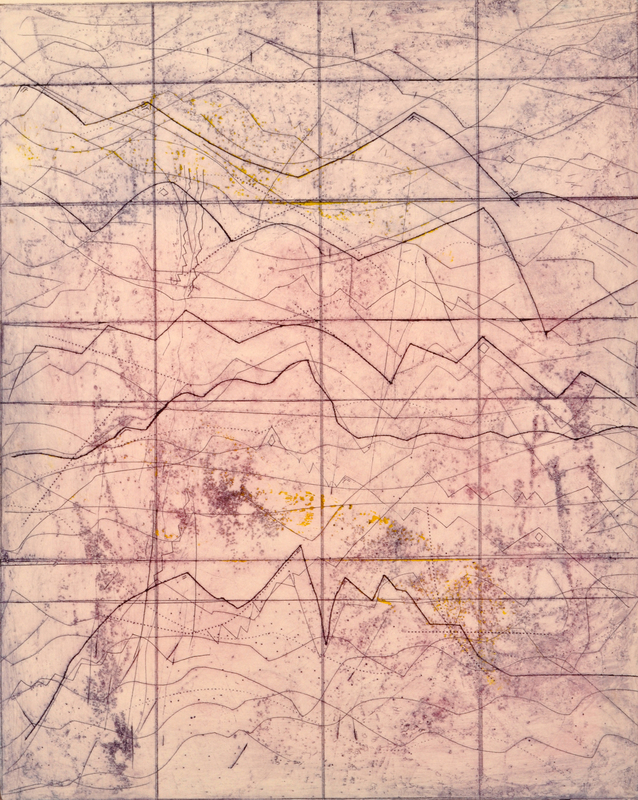 Ruthie’s current work takes its cues from maps and geography. [biocreativity] Ruthie, tell us a little bit about yourself and your background. [RP] I am a printmaker who also creates complex surface design with dye on textiles. My art education has been pieced together over time beginning with photography and graphic design classes in the university and community college setting. I also have taken many workshops: art quilting, textile dyeing and surface design. 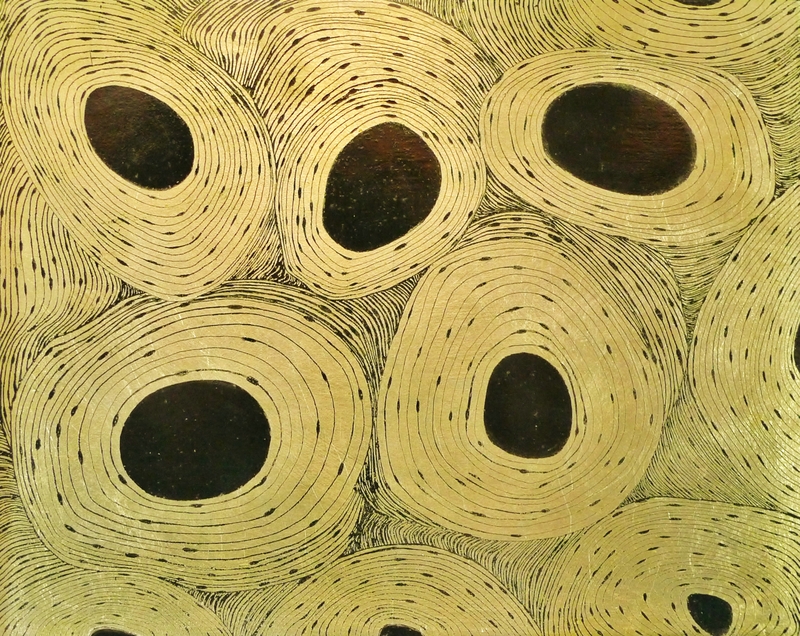 Workshops in the last several years include a week-long Painted Intaglio workshop at Making Art Safely with Lennox Dunbar, four days with Debbie Little Wilson at Hill Country Arts Foundation and many one- and two-day printmaking workshops through Women Printmakers of Austin (Texas). Very recently, I took a 2-day workshop at Southwest School of Art in San Antonio with visiting artist Aimee Lee about hanji, the Korean paper. [biocreativity] Here on biocreativity, we’re always curious to know, what is it about nature that inspires or excites you? I love being an artist and am interested in science through nature. I am constantly amazed with ways nature presents beautiful designs and compositions. I enjoy learning and naturally ask “I wonder why…”. So when I am in nature I am constantly observing plants, animals, and the environment around me. My science and nature learning usually comes when I see something that interests me that I cannot explain or do not understand. Once I planted passion vine, thinking it was so beautiful. Then I noticed the leaves were being destroyed. I was upset until I saw that a butterfly was coming often to the plant. I learned it was the gulf fritillary. More observation let me see the chrysalis, a strangely-beautiful shape hanging from the vine. With more patience, I was able to watch the female gulf fritillary place her honey-colored eggs on the passion vine plant. That was the full cycle, learned over several weeks of observation. Right now (early April in Austin, Texas) I am watching my rue plant which is larval food for the giant swallowtail butterfly or one of it’s close cousins. The caterpillars are all over the rue plant in various stages of growth. [biocreativity] It’s great to see the ways science and art can lead to questions and then maybe provide some answers, how do you view the interaction of arts and sciences? [RP] Both involve creativity, exploration, and observation. It is not unusual to find an artist who is interested in the sciences such as the watercolorist who paints plant life. [biocreativity] This series seems to be inspired by more than just the outdoors, there are a lot of linear and geographical elements. What inspired you to do this series? 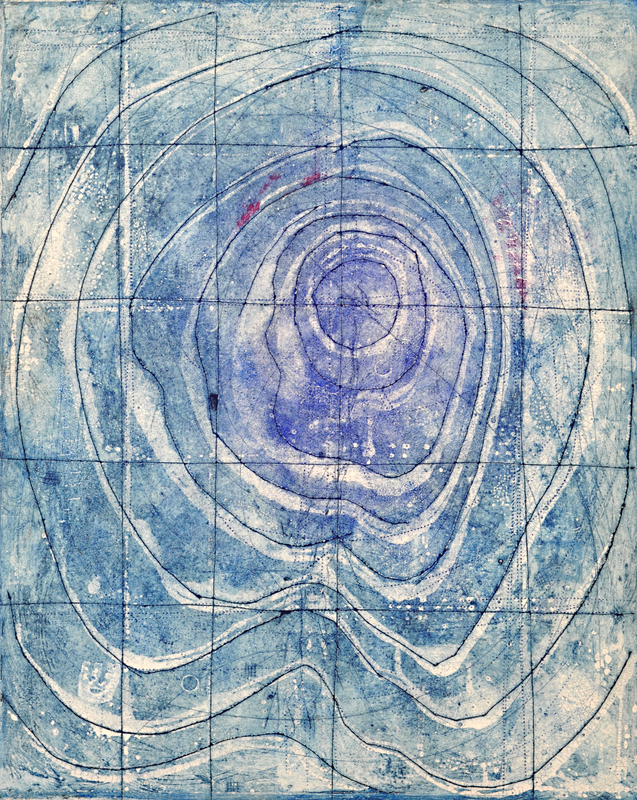 [RP] My current printmaking series, GeoTopo, is inspired by maps and geography both real and imagined. Living in central Texas, I have any opportunities to observe the land—the Texas Hill Country with all it’s shapes—hills, valleys, waterways, and dry creeks. As a child, I was the navigator on family road trips so I became very familiar with map reading and symbols. I have travelled a lot and enjoy having a map to guide me as I go. I bring the maps back home to add to my collection. I also have enjoyed reading about travel and looking at landscape photos throughout my life. One serendipitous day about a year ago, I found an Encyclopedia Britannica World Atlas from 1960 that was being thrown into a trash bin. I grabbed it and took it home. I tried doing various art projects with this oversized volume, but nothing seemed to catch my interest until I decided to create GeoTopo, a series of prints based on Map, one of my prints. The atlas then became a great visual resource. I studied it, browsing forward and back, and realized that I could use specific maps as visual models for prints. For example, the Kansas state map shows the even spacing of towns between mail stops from the days when postal service was by stagecoach. This visually translated into the Mail Stops print. I also found maps of airline flights in the atlas. This reminded me of times looking over the maps in the back of airlines magazines. 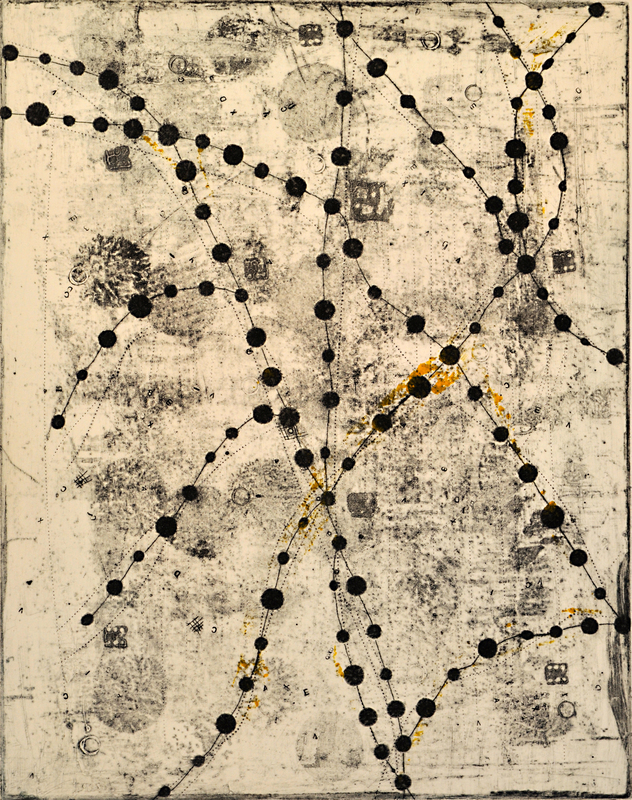 So, the print Flight Paths became part of the GeoTopo series. [biocreativity] What is the most important thing that you want others to know about your art? [RP] Printmaking itself is a very tactile and kinesthetic experience. My whole body is involved in the process, from touching the paper, to inking the plate. All my muscles and joints are involved. I really enjoy the process–the plate making, the adjustments to the plate while proofing, and the printing itself. I enjoy playing with the different colors of ink to see how they combine on the print to make new colors. This is a continuation of the color mixing I learned while dyeing fabric, which I have brought to printmaking on paper. [biocreativity] Before you go, one last question. What is your advice to young artists and scientists who might be thinking about getting into art-science projects? [RP] Take a process you enjoy and do it over and over and over. You will get unexpected results. You will find your style. [biocreativity]Thanks so much for taking the time to chat with us! Where can we hope to see you go next? [RP] I currently have five prints in the BioTopo series. I have at least three more in process, so I will continue with them. I am printing editions of 12 prints for each plate, so that is a lot of intense studio time. I always have many more ideas for projects than I am able to do. Perhaps I will work with designs inspired by historical insect prints. Maybe I will work with a process I learned in a workshop that I have yet to explore. I am just not sure! Find Ruthie elsewhere on the internet! 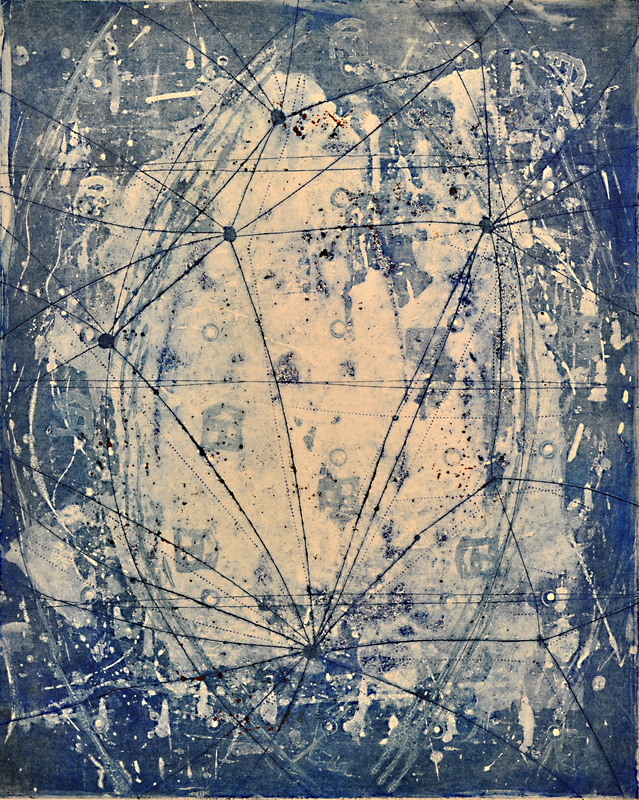 I am pleased to welcome artist Annell Livingston to the biocreativity blog as a continuation of the Art + Science Series. 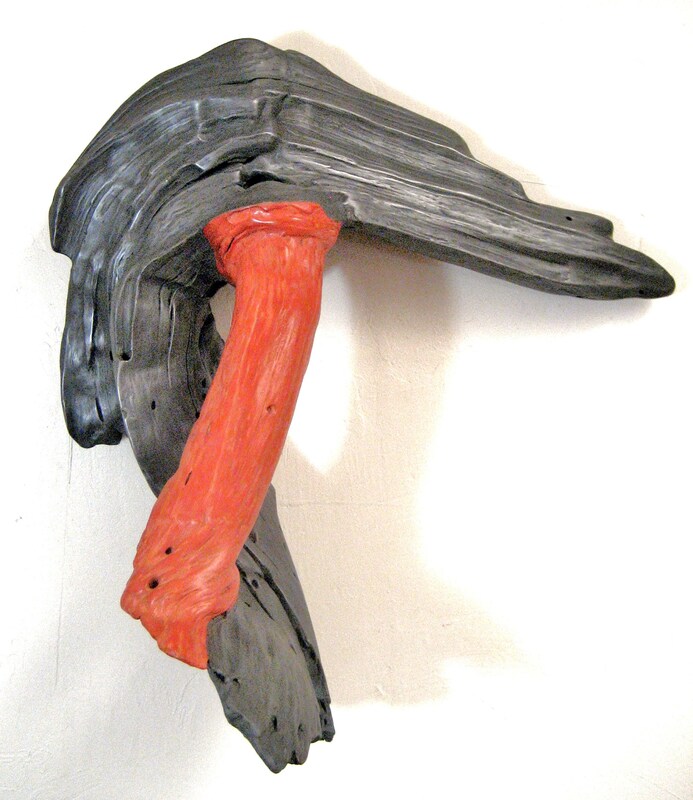 Annell’s work takes its cues from her current home in Taos, New Mexico. Her paintings feature geometric patterns inspired by the tension between urban landscapes and natural environments. [biocreativity] Welcome to the biocreativity blog Annell! Tell us a little about the kind of art you create. [AL] I am a painter and have painted in most every medium. Now, I choose gouache, for it’s inherent qualities of saturated pigment and flatness. I love to paint. It is what I do, and have been doing for the last 50 years. Unless I have other responsibilities, I am in the studio. [biocreativity] What is your educational background? [AL] In the early 1960’s, I began studying art at the Lowell Collins School of Art, in Houston, Texas, with an emphasis on painting and drawing. Then I studied at the University of Houston, where the late David Hickman was my experimental teacher. And I studied at the Glassell School of Art at the Museum of Fine Art in Houston. I think the way of the artist is a lifetime of study. The artist is always reaching for something, just out of reach, always challenging herself. [biocreativity] As an artist, I agree that it’s a lifetime of study, always learning something new. I find that science can teach us a lot how to explore our world and challenge us. How is your work inspired by science? [AL] Science can be thought of as knowledge attained through study or practice. And the way of the artist is the same. 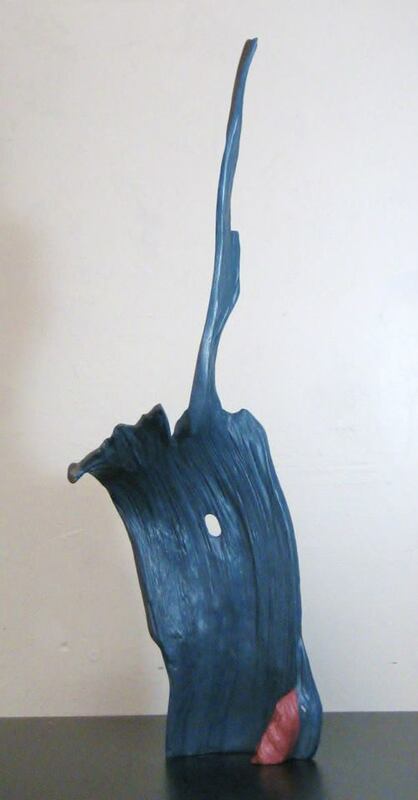 My work is based on geometry and the observation of the material world, especially light, and color. In the 1980’s I asked myself the question, “What do I know, and how do I know it?” I lived in the city, I drove to work at the studio each day on the freeway. My studio was downtown in a warehouse, and the sounds that came into the studio were from the cars and trucks on the freeway. All day I stood on concrete. The answer to my question was, “My experience was the city, building with exposed skeletons. If you looked down on the city, you would see it is based on the grid. And we are informed by the light, which is often reflected on manmade materials.” I began observing the light, and keeping notes about it. I allowed the square to be a metaphor for the urban experience. It was not long, before I moved to Taos, New Mexico. My work did not reflect the rural experience that was Taos. This little Northern New Mexico town was not urban. How do I talk about this experience? The square seemed too much ‘man over nature.’ At last I randomly added the diagonal line, this broke up the grid to allow shapes that allowed me to think of the irregularity of the landscape; rivers, mountains, and canyons. This diagonal line seemed to be the perfect answer, and can been seen in the weavings of the Navajo people. I choose the color from nature, which required careful observation of the world around me. I was speaking in a contemporary voice, but reflecting what I saw in nature. [biocreativity] How has this experience lead to your current work? [AL] My current work, “Fragments, Geometry and Change”, continues the ideas I have been investigating in past work. I break the picture plane into small pieces, metaphors for my experience of life, memory and thought. It seems to me, it is never experienced as a whole, but in bits and pieces. My compositions are based on geometry, which I draw with a ruler. I began with one color randomly selected, then each color selected after is based on simultaneous contrast, which is the use of two colors, painted side by side, that interact with one another and change the visual perception accordingly. This affects the viewer’s sense of the color. Though the shapes are not altered, patterns appear, disappear and change in their appearance. This is based on the observable phenomenon in nature of changing light and color. An example might be the way the color of the leaves seem to change as the winds moves through the trees. [biocreativity] Thanks so much Annell for the interview! 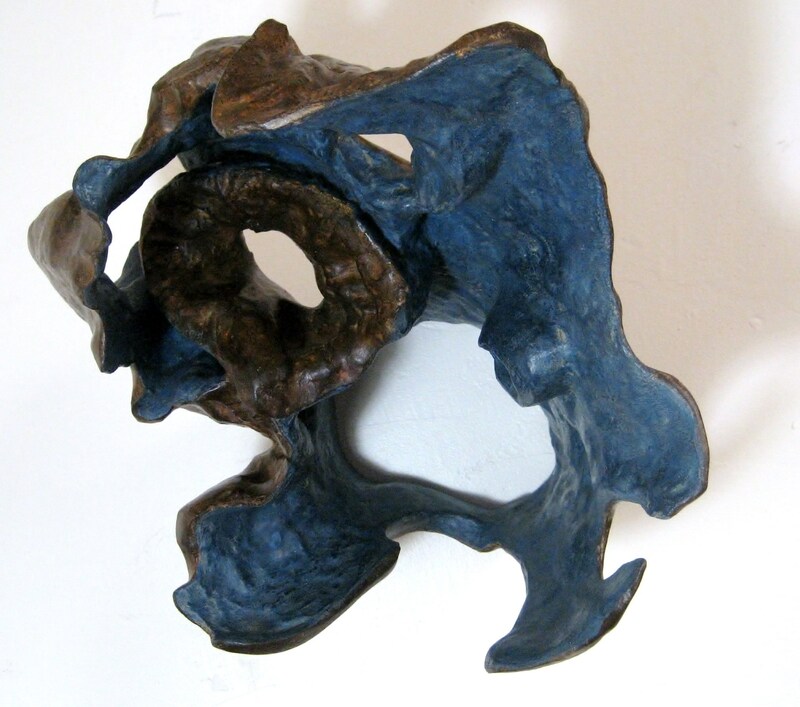 If you loved Annell’s work, she will be featured along with three other artists in our latest exhibit, Geo_____! The show will run from April 12 – May 18th, 2014. Opening reception will be held April 12th 7-11PM. Introducing the NEW Art + Science Series! Greetings biocreativity readers! As many of you know, the biocreativity blog started as a way for me to explore the interrelationship between the arts and biology. I heard from so many artists looking for a place to exhibit their biology-inspired artwork, that the blog eventually inspired me to found a brick-and-mortar art gallery to exhibit science-inspired art. Well, Art.Science.Gallery. has started the new year in a new gallery space at Canopy in east Austin, and I couldn’t be more excited about our exhibitions for 2014! I invite you to come and visit whenever you’re in Austin: 916 Springdale Rd, Building 2, #102, Austin, TX 78702. You can also follow the gallery on Facebook and Twitter (@artscigallery). I’m so happy to report that Art.Science.Gallery. exhibited the work of nearly 200 science-inspired artists in 2013 (check out our past exhibitions here), and we’ve got an exciting schedule of nine science-inspired exhibitions lined up for 2014 (including two open call exhibitions)! So what has become of the biocreativity blog? 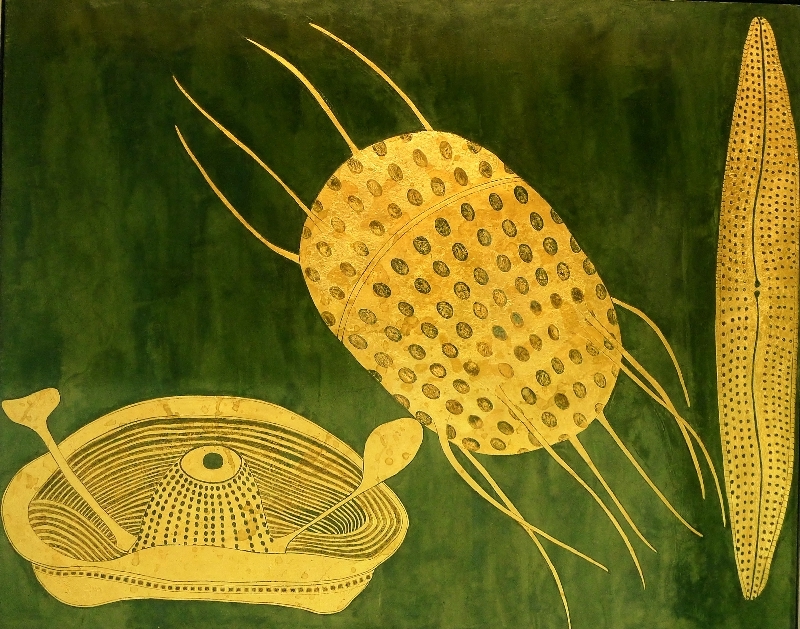 Since I’m a biologist by training, the biocreativity blog has thus far featured biology-inspired art. Now that Art.Science.Gallery. is up and running, I’ll be featuring art inspired by all of the natural sciences. I’m happy to announce that the ECO Art + Science Series is being reborn to be more inclusive of other scientific disciplines, as the Art + Science Series. I’ll be featuring interviews with artists that we’re exhibiting at Art.Science.Gallery.! And, as always, I enjoy learning of new artists who are merging art and the natural sciences, so keep me informed in the comments and stay tuned for our first Art + Science Series feature on Katey Berry Furgason’s Portraits of the Microscopic paintings and Collaborations with Insects, Weather, Time, Wood + Root sculptures coming up very soon! Hi there biocreativity readers! I’ve been hard at work putting together our new brick-and-mortar gallery space at Art.Science.Gallery. (we’re plannign to open with an awesome entomology show in November!) and I thought you might like this guest post I did for the Broaden Your Impact blog. How have you used art to enhance your science! ?